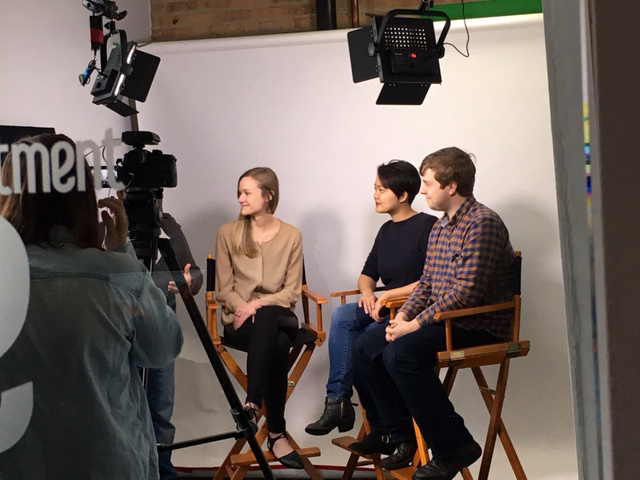 DFA Northwestern Featured on advisor TV's "Big Shoulders"
Design for America (DFA) was recently featured on advisor TV's “Big Shoulders,” for the social impact they are creating within their communities. Hosted by Adam Hecktman, director of technology and civic innovation for Microsoft, “Big Shoulders” highlights leaders, participants and drivers of civic technology in Chicago. In this episode, Hecktman spoke with DFA Fellow Allison Chen, Stacy Klingbeil, DFA field coordinator and EDI alumna, and Luna Lights CEO Donovan Morrison. The group discusses the mission and work of DFA, specifically focusing on Luna Lights, a project started at DFA Northwestern that helps prevent nighttime falls for older adults.